#6 on the UFO challenge is done! But remember where I started? Tomorrow Judy will pick another number and it's good timing for me. Long story short, I'm between projects and waiting. The UFO challenge will fill the gap nicely. Yea! It is done. I love the pinks, lavendars and greens. Great combination of colors and fabrics! Very pretty colors and fabrics! 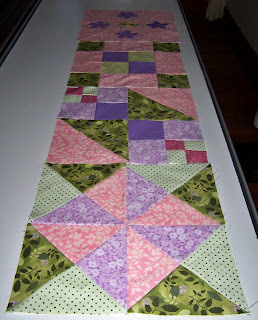 Great piecing! ---"Love"
Pink, green and purple. What a great color mix! Very pretty. I love the colors and the assymetry of the piece. Very pretty. Great color combo! Congrats on finishing it! colors are really good together. That is my biggest problem. Is this a kit? I think I quilted a quilt just like this for someone last year. Congrats on a great finish! I sure do love your colors! Very pretty. A breath of spring while a new storm hits the country. I love all those colours as well. Perfect for spring! A step in the right direction... that is how I am approaching some of the larger UFO's in my list... just to the next step will be good enough. Love all the colors. They do look springy and I sure could use some spring right now. Aren't you smart, breaking the big project down! That is going to be one pretty quilt! I like how you set reasonable and specific goals for each month...these blocks are so pretty! They are looking lovely! Congrats on the finish!